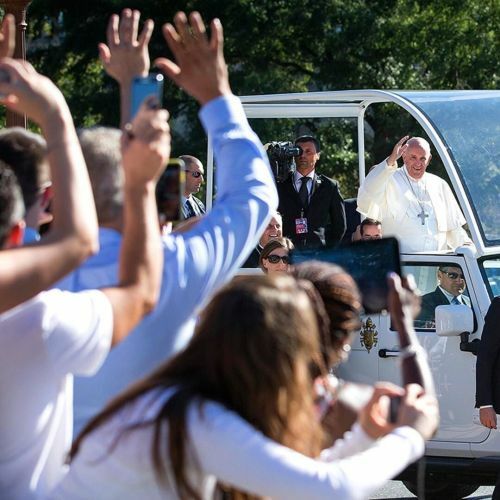 "Wherever Pope Francis (@newsva) went in Washington on Wednesday, fans flocked, with a few scattered protesters. @nytmills photographed @newsva riding in the #popemobile to greet an enthusiastic crowd before he entered the Basilica of the National Shrine of the Immaculate Conception, the largest Roman #Catholic church in the United States. During his first Mass in the country, in front of an estimated crowd of about 25,000 people, the #pope canonized Junípero Serra, a Franciscan who founded missions across California in the 1700s. Father #Serra is the first person declared a saint on American soil. Follow @crowleygraph, @zachgibson5, @gdemczuk and @ericthayer to see more photos of the #popeindc." By nytimes on Instagram.